If you're expecting the speed of a web download on your laptop to be anywhere near what your phone or cable company advertised, you better start lowering those expectations. The Federal Communications Commission is saying that consumers are getting way less than promised in download speeds. A new FCC study is reporting dramatic differences between the "up to" figures touted by phone and cable companies in promoting their web connections and the speeds consumers actually get. According to the FCC, the differences exist, no matter how consumers get their broadband. "Actual download speeds experienced by U.S. consumers lag advertised speed by roughly 50%," according to an FCC technical report released this week. While saying clearly that you're unlikely to get a download at the advertised speed, the FCC was less specific on whether it is because Internet providers are fudging in their ads. Computer performance; local Wi-Fi network hardware and configuration issues; and overburdened Internet sites could be contributing to the slower speeds, it said. "'Cheated' is a strong term," said Benjamin Lennett, senior policy analyst for the New America Foundation's Open Technology Initiative, which analyzed the FCC report. "Clearly there is a problem going on." The FCC report said in 2009 consumers subscribed to connections advertised as averaging a speed of up to 7 to 8 megabytes per second. The average download speed consumers actually got was 4 megabytes per second, and heavy Internet downloaders got about 3 megabytes per second for their average downloads. The report also said that the differences between the advertised speed and the actual speed occurred whether the Internet came by fiber, cable, DSL or satellite. Fiber networks are advertised as providing 10 to 15 megabytes per second; cable connections 8 to 11 megabytes per second, and DSL connections 2.5 megabytes to 3.5 megabytes per second. In fact, consumers using them got 7.7 megabytes per second for fiber connections, 5.5 megabytes per second for cable connections, 2.0 megabytes per second for DSL and 0.7 megabytes per second for satellite connections, though some heavy users got a little less. There has been intense criticism both at the FCC and among Internet providers of the current methods of measuring Internet speeds. One issue is that computer downloads and software tests run from a computer aren't a very good measure because too many configuration and equipment factors can skew the results. In addition, neighbors with the exact same equipment can get different speeds because of the distance to the outside connection box and the number of computers using the connection at different times of day. The FCC says it has begun a study aimed at providing a better measure of the speed. "We have not had time to examine the report in detail, but it is important to consider all the variables that are involved in the quality of a consumer's broadband experience," said a spokeswoman for the industry association, USTelecom in response. 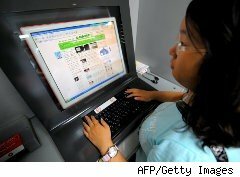 She noted that the latest study specifically acknowledges that "actual download speeds" are dependent on a variety of factors outside the control of Internet service providers including "slow computers, under-functioning wired and wireless routers, or the performance of websites and applications." Lennett said it's still apparent that consumers are being promised one thing and getting another. "It's not a surprising phenomenon, but there is a need for greater transparency for consumers," he said. He also noted that a court ruling has raised questions about the FCC's authority to make speed claims.